Posted by Steve on March 9, 2016 . Leave a comment. Despite thousands, or perhaps millions, of words, navicular disease remains a subject of confusion and error. There’s been a “method to my madness” in my past three articles (plus The Hoof Landings Tower of Babel, which wasn’t part of the original plan!) entitled The Myth of the Heel-First Landing. In addition to addressing the commonly-held misconception that horses are “designed” to land heel-first, the material was presented to help prepare the reader for coming to terms with the information I’ll be presenting on navicular disease. 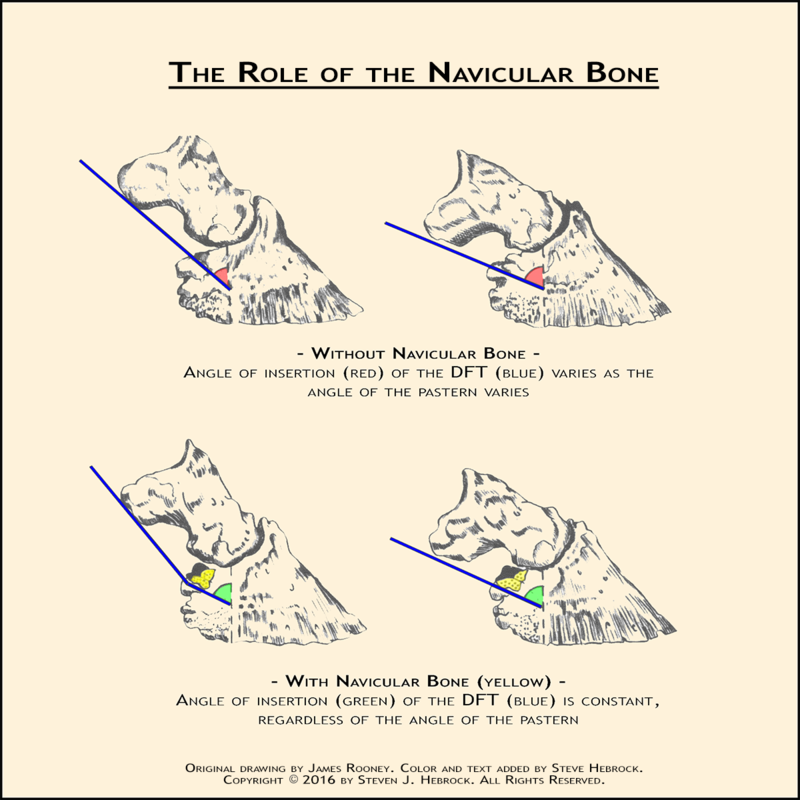 In this series of three articles, I’m going to attempt to shed some light on the navicular bone and hopefully allay some of the fears the horse owner experiences when he or she hears a diagnosis of “navicular” by the veterinarian. This particular installment will concentrate on an explanation of the role of the navicular bone in support and locomotion, and discuss how and why damage can occur. Part 2 will describe how navicular disease is diagnosed (and misdiagnosed), and the final article will focus on how to treat and/or manage the “navicular” horse. 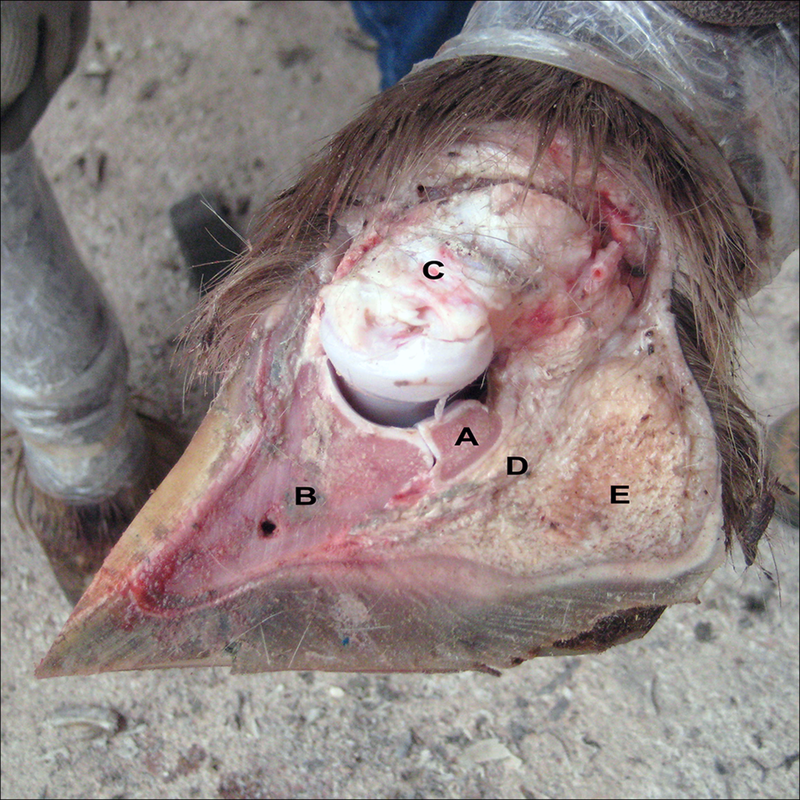 As you can see in the photo at the beginning of this column, and in the above photo of a cutaway cadaver hoof, the navicular bone (A) lies right behind the coffin (pedal) bone (B) and forms part of the coffin joint along with the short pastern (C). 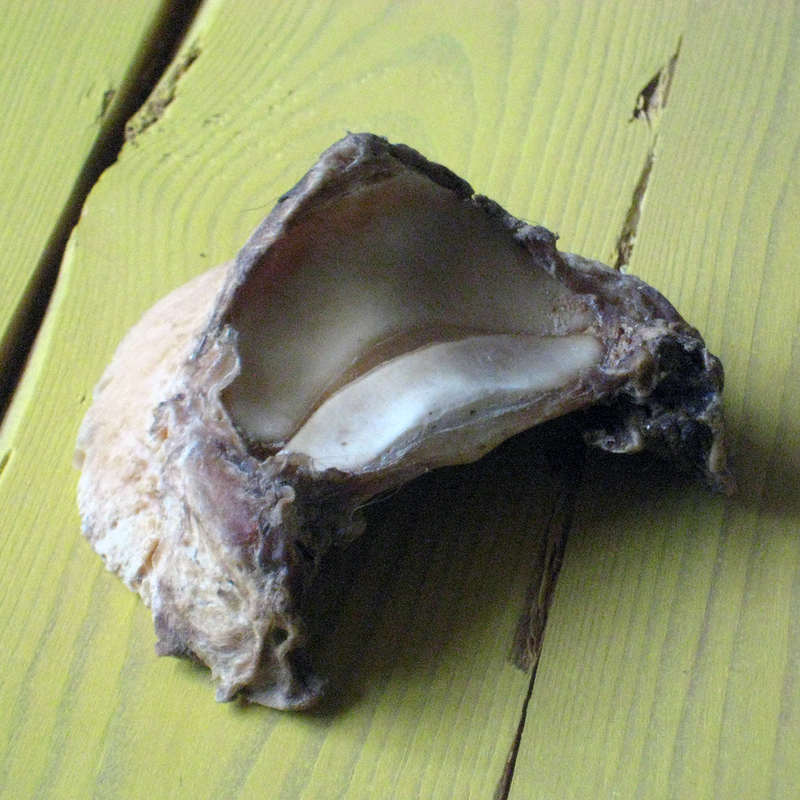 You’ll also note the band of grey-white tissue running down the back/bottom surfaces of the bone that connects into the bottom center of the coffin bone. This is the deep digital flexor tendon (D), often abbreviated “DDFT” or simply “DFT,” which is responsible for both helping to stabilize the foot and flexing the foot towards the back of the horse. It also forms part of the “stay apparatus” of the horse – the horse’s suspension. Beneath the DFT is the largest structure in the foot – the fatty-fibrous mass of the digital cushion (E). As you can see, without the navicular bone in place, the direction (and therefore the effective magnitude) of force exerted by the DFT would be highly dependent on the orientation of the long and short pastern bones with respect to the coffin bone. But with the navicular bone acting as a “pulley” to redirect the motion of the DFT, the force on the coffin bone will not change direction when the leg changes position. As the hoof impacts, palmar flexion (rotation) of the coffin joint begins from zero acceleration. If the ground is hard, it will not yield under the hoof impact (will not absorb energy of impact), and the hoof may bounce, hit the ground, bounce again, etc. This bouncing, of course, would not be grossly obvious, but would involve oscillation of the coffin joint by a few millimeters. If the hoof as well as the ground were inelastic, the effect would, of course, be exaggerated. Neither ground nor hoof could yield sufficiently to quickly convert kinetic to potential energy. The energy would remain kinetic, oscillating back and forth between hoof and ground. For the record: how do I know he’s describing a flat landing in the preceding quotation? The answer is simple: because he states “rotation of the coffin joint begins from zero acceleration.” And the only way that’s possible is if the hoof is contacting the ground flat. So even with a proper landing, there is some amount of vibration (oscillation) of the hoof, relative to the hardness of the landing surface and the inelasticity of the hoof capsule. In contrast with the equine hoof, there is a considerable body of research on the effects of oscillations on humans’ hands and arms, although there is some dispute over various researchers’ conclusions – largely because differences in the types, frequencies, and durations of exposure used in various studies make analysis difficult. But the symptoms of hand-arm vibration syndrome (HAVS) among people who use various types of vibrating powers tools include destructive joint changes as well as vascular, neural, and muscular problems. In fact, you may be interested to know that it’s considered a serious enough health risk that the limits for vibration exposure for human workers are specified by the International Organization for Standardization (in ISO standard 5349-1)! In the horse, when the coffin joint oscillates, the deep digital flexor tendon is moving very rapidly and repeatedly across the surface of the navicular bone. Why does that matter? Because when one surface moves rapidly over another surface, the friction between the two generates heating of the surfaces. Think warming cold hands, or starting a fire, by rubbing two things together – same idea. The more rapid and/or more sustained the motion, the higher the resulting temperature. Conversely, with slower and/or less-sustained movement, things don’t get nearly as hot. So, terrain and footwear being equal, a horse that’s moving at low speeds is experiencing less DFT/navicular bone friction, and therefore less heating, than the horse who is moving at higher speeds. In case it has not been said often enough, sudden changes of acceleration cause third-order acceleration, which is vibration: increased friction, turbulence, cavitation, heating, etc. The general case…is that third-order acceleration occurs between the DF and the navicular bone. Vibration, which is third-order acceleration, causes tendon degeneration and navicular arthrosis. The third-order acceleration, in turn, will occur because the coffin joint does not begin rotational movement from zero acceleration. Sound familiar? It bears a striking resemblance to what’s been well-documented in humans experiencing HAVS, doesn’t it? This is also why feral horses don’t develop navicular disease. As I’ve explained in The Myth of the Heel-First Landing series, the feral horse’s hoof continuously wears itself such that, in general, the hoof (and therefore the coffin joint) does not experience rapid rotation as it makes contact with the ground i.e. it lands “flat.” And because the feral horse lands without the sudden “jerk” that occurs when many of our domestic horses make initial ground contact with the heels or toe and then “slap” the foot down as it comes under load (see the YouTube video accompanying The Hoof Landings Tower of Babel), the navicular bone in the feral horse doesn’t experience nearly as much rapid movement of the DFT across it with every step. The more pronounced the heel- or toe-first landing, the greater the distance the DFT travels across the navicular bone, resulting in higher/more-sustained temperatures. As the inelasticity of the unbalanced hoof increases, the less it can deform to mitigate the forces of impact, resulting in more vibration and consequent higher/more-sustained temperatures. Like the stiffness of the hoof, the less the unbalanced hoof is able to penetrate the terrain at the instant of contact, the greater the vibration and resulting higher/more-sustained temperatures. The faster the horse is moving, the more frequent the coffin-joint rotation, and the greater the buildup of heat. As with speed of movement, longer periods of movement of the unbalanced foot will result in higher/more-sustained temperatures. The smaller the size of these structures, the less effectively they can dissipate heat buildup. Looking at this list should make it apparent why “true” navicular disease (more on that subject later!) rarely occurs in horses that don’t either jump, or trot on paved roads. Those two activities, particularly when coupled with improper hoof care, experience the highest magnitude of (jumpers), and most prolonged (road horses), third-order acceleration of the coffin joint. I also feel compelled to add that this explanation of the cause of navicular disease is by no means new. Dr. Rooney wrote The Biomechanics of Lameness in 1969! And while that particular book is admittedly quite technical and often difficult to read, both versions of his subsequent book The Lame Horse (1974 and 1998), which are intended more for the horse owner than the veterinarian, also describe this logical, evidence-based theory. Why, then, does there continue to be such a prevalent and profound misunderstanding of the cause of navicular disease among veterinarians, hoof care providers, and horse owners, with its consequent misdiagnoses and illogical “treatments” that cannot possibly succeed? And that concludes Part 1 of this series! But after reading about the effects of vibration on humans (HAVS), I’m also very curious about whether or not some of the other consequences of vibration, like numbness, may occur in horses as well. Wouldn’t it be interesting to know if, over time, the unbalanced horse was actually losing sensation in his feet, and therefore allowing more damage to occur without his being aware of it? In my experience, the overwhelming majority of horses diagnosed with navicular disease or navicular syndrome do not, in reality, have any issues with their navicular bone or deep-digital flexor tendon. I’ll explain why I feel confident making that statement, as well as why so many horses are misdiagnosed, when I cover diagnosing navicular disease in the next article in this series. 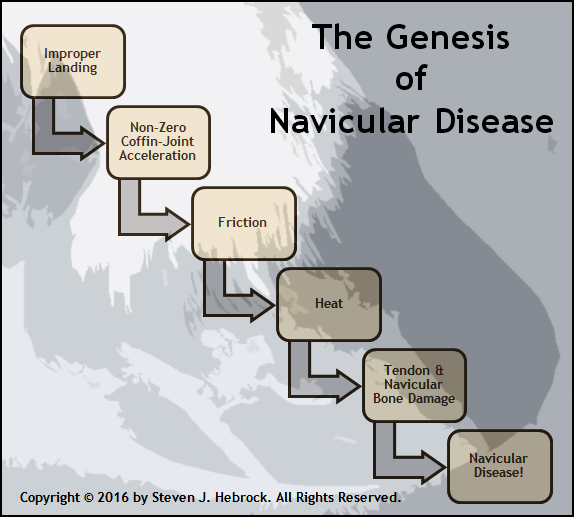 Share the post "Navicular Disease – Part 1: Background"